Born 1973 in Paris (F). Lives and works in Clermont-Ferrand. Stephan Raymond is a French painter and graffiti artist, who calls himself Keymi (French slang for Mickey). The talent grew up in the Parisian banlieue. Although he used to draw daily, he decided in 1990 to start making art professionally. Influenced by the hip hop culture he specialized in graffiti and urban art. 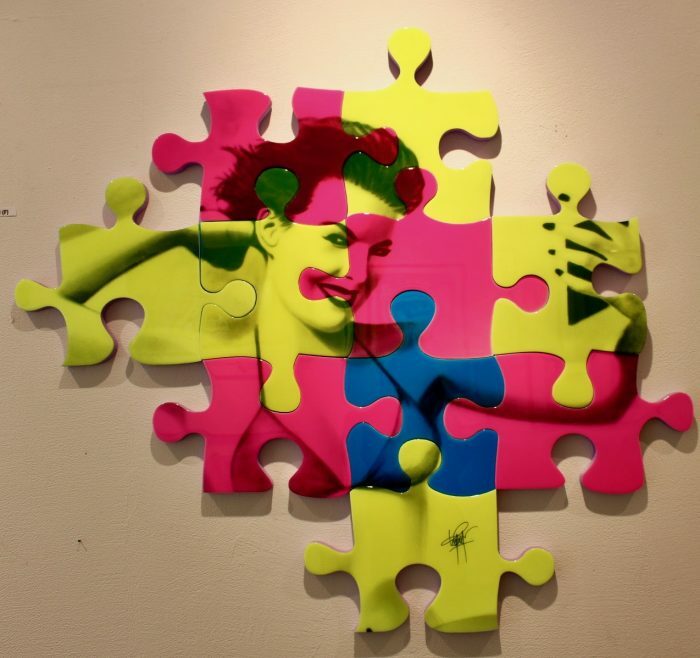 Nowadays he’s mainly known for his pin-up puzzle series and single puzzle works as a fusion of manga with pop art. Painting women of the 1950’s on big puzzle pieces has become his trademark. All works are mixed media with spray paint, resin on polystyrene to grade them up. In several exhibitions in France and abroad Keymi could convince his audience. With the duo-show „French Pop“ Foxx gallery presents him for the first time in Switzerland. Featuring his puzzle objects in mixed media. All of them are originals and hand-signed. Represented by Foxx gallery since 2018.